SEOUL (Reuters) - High-ranking military officials from North and South Korea met on Wednesday to discuss recent border altercations including exchanges of fire but they did not resolve their differences, South Korea's Defence Ministry said. North Korea's military fired shots on Friday at big balloons released by a private activist group from the South carrying leaflets with messages critical of North Korean leader Kim Jong Un. Some bullets landed in South Korea and its military fired back. There were no casualties. Earlier last week, the two sides exchanged fire after a North Korean patrol boat crossed a sea border that the North has long disputed in an area where naval clashes have in the past killed scores of sailors on both sides. 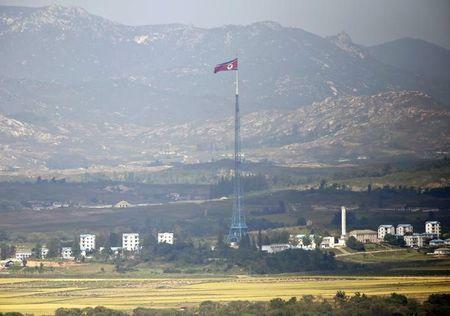 The military officials met at the request of North Korea at the Panmunjom truce village on their fortified border, said South Korean Defence Ministry spokesman Kim Min-seok. It was the first time in more than three years that military officials from the two sides have held talks. "The mood of the meeting was sincere as both sides were serious about improving ties, but this was the first meeting (in a while) and there was a difference in view that we were not able to narrow," he said. The North Korean officials demanded that South Korean navy vessels do not cross what it sees as the sea border. They also called for a stop to the release of the balloons carrying leaflets by the South Korean activists, Kim said. North Korea has long criticized the leaflet drops as provocative and it had threatened to respond to them with force. But before Friday, it had never done so. North Korea's state media said on Saturday that expected talks with the South to try to improve ties were in danger of being canceled because authorities in South Korea had allowed the activists to float their balloons. South Korea says it has no legal justification to stop the activities of private groups, but it has urged them against sending the leaflets on safety grounds. North Korea sent a high-level delegation to the South on Oct. 4 and agreed to resume dialogue that was suspended in February, raising hopes of a breakthrough in relations. South Korea on Wednesday proposed Oct. 30 for a meeting to discuss allowing reunions of families separated during the Korean War, and to discuss sanctions on North Korea imposed after clashes in 2010 that killed soldiers and civilians in the South. North Korea, heavily sanctioned by the United Nations for its missile and nuclear tests, is technically still at war with the South after the 1950-53 Korean War ended in a truce, not a peace treaty.